Please be advised that per your lease the office MUST have a key to enter into your unit. 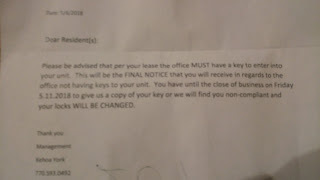 This will be the FINAL NOTICE that you will receive in regards to the office not having keys to your unit. You have until the close of business on Friday 5.11.2018 to give us a copy of your key or we will find you non-compliant and your locks WILL BE CHANGED. Yes, I'm mentioning the manager's name this time; respecting her privacy is clearly pointless. And frankly, if any future would-be employers Google her name, there needs to be a record of her appallingly unprofessional behavior; this woman is both dishonest and dishonorable, and cannot be trusted with anything remotely resembling "authority." First, we received a "final notice" without first getting any prior notices. Second, despite the date reading May 8, we did not get this until well after the end of business hours on May 10, ordering us to produce a copy of the key by end-of-business next day. (Indeed, had Jeff not gone out, we would not have found that message until we left our house tomorrow.) As with that slanderous "illegal drug violation" they stuck on our door, they gave us a threat which could only be resolved by taking time off work, if we had a regular nine-to-five schedule. Third, why is it our fault if they lost their copy of our key? UPDATE, May 11: Turns out Ms. York had a copy of our key all along; apparently EVERYBODY in the apartment complex got a copy of that threat-letter. No apologies for the inconvenience, the threat of being locked out of our own home, or anything else, of course.